The eye has many parts that work together to create vision. The eyes themselves are only part of “seeing.” The brain is also involved. The eyes, though, begin the complex process of vision by gathering, focusing and passing on visual information to the brain. 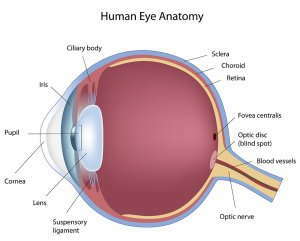 To help you learn how the eye works, here is a quick overview of the anatomy of the eye. This information is also useful in understanding which parts of the eye are affected by different health problems of the eye. Cornea. Light first enters the eye through this transparent, dome-shaped surface that covers the front of the eye. The cornea bends — or refracts — the light onto the eye’s lens. Pupil. This is the round hole at the front of the eye that appears black. It is located behind the middle of the cornea and is surrounded by the iris. Iris. The iris, or the colored part of the eye surrounding the pupil, controls how much light enters the eye. The iris can make the pupil bigger or smaller by opening or closing. Lens. Behind the pupil and the iris is a transparent structure that looks similar in shape to the lens of a magnifying glass. Unlike glass lenses, though, this part of the eye can change shape. This enables it to bend the rays of light even more, so they land in the right place on the retina, at the back of the eye. Vitreous body, or gel. The eye is filled with a gel that helps it keep its round shape. Light entering the eye first passes through the cornea then the lens and then the vitreous body before reaching the retina. Retina. At the back of the eye is the retina, or a thin layer of light-sensitive nerve cells. The retina contains different types of photoreceptors — called rods and cones — which respond to light that lands on them. Cones. These light-sensitive nerve cells are located in the macula, which is located at the center of the retina. Cones are necessary for focused central vision. Cones also enable you to see colors in bright-light conditions. Rods. These light-sensitive nerve cells surround the macula and extend to the edge of the retina. The rods provide you with your side, or peripheral, vision. They also help you see at night and in dim light. Optic nerve. The cells of the retina turn light into electrical impulses. These electrical signals are collected by the optic nerve — a bundle of about 1 million nerve fibers — and transmitted to the brain. The brain puts all this information together to produce the image that you see. To learn more about eye anatomy or to have your eye health examined, please contact our practice.